The supposed only photograph that exists of this lost movie. Nights of the Werewolf (Or his original Spanish title, Las noches del Hombre Lobo) was a 1968 Spanish/French horror film directed by René Govar and written and starring by Jacinto Molina Alvarez, known as Paul Naschy. The story deals with a professor who learns that a student of his suffers from lycanthropy, and under the guise of helping him, uses him as an instrument of revenge by controlling him by means of sound waves when he transforms. Unfortunately, very little information on the film has surfaced. Even standard details such as cast and crew are controversial because there isn't information about them except the same Paul Naschy. 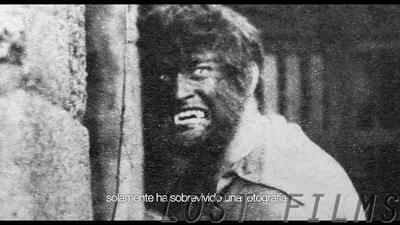 The "Spanish Werewolf" Paul Naschy was the only person who, until his death, insisted that the script was filmed. He insisted in interviews that were filmed in Paris. The "director", Rene Govar, was "killed" in a car accident a week after the film was sent off to the lab for processing. Then, the story changes depending on the source: Some say that the film was in the car and was destroyed in the accident. Other say that since no one ever paid the negative costs, the lab held onto the film for collateral and later misplaced or discarded it. In fact, the lead actors whom Naschy attributed to this film (Peter Beaumont and Monique Brainville) apparently never existed; and René Govar has no other credits on IMDb, nor is there a record of a director named Rene Govar ever working in the French film industry. Some thinking that Naschy may have made it up to boost his resume at a time when he was just starting out in the industry. It is possible this film later somehow became the 1970 La Furia del Hombre Lobo (The Fury of the Wolfman), as the plots of the two films are very similar, and that would explain why Nights no longer exists. In the documentary dedicated to the legacy and memory of Paul Naschy, "The Man Who Saw Frankenstein Cry", it is shown a supposed picture of that lost film. Wikipedia page on the film. Lost Film European page on the film.